This sign is for Coast to Coast Commercial Travelers. The sign’s colors are blue and yellow. 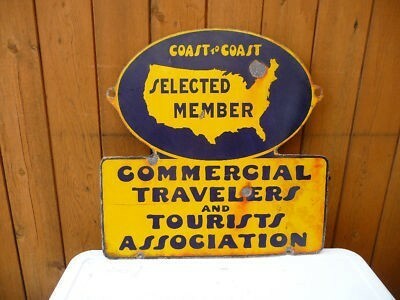 The text on the sign reads: Coast to Coast Selected Member Commercial Travelers and Tourists Association. The sign shows a die cut with the USA map and text.